Kasabian frontman Tom Meighan has told Gigwise that he felt the 2008 edition of the Glastonbury Festival was “rubbish” and has called for more “honest” coverage of the event. He accused people who had given positive feedback about last month’s festival of “lying” in order to “cover it up like it was a success”. Kasabian, who performed on the Pyramid Stage in 2007, missed this year’s event in order to continue working on their third album. Instead, the band will headline the Creamfields Festival in Cheshire next month alongside Fatboy Slim. Speaking exclusively to Gigwise, Meighan said: “To be honest with you I thought Glastonbury was rubbish this year and I'm not just saying that. “I think people are lying again to cover it up like it was a success and it wasn't, it was really poor. It was really bad. When asked why he felt the festival had been “rubbish”, he said the entire line up, which besides Jay-Z included The Verve and Kings of Leon, was “not strong enough”. “There wasn't even anything exciting really, that's just my opinion you know,” he said. 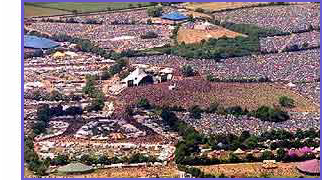 “But it wasn't a success, it was just a very strange year for Glastonbury. Meighan said that people had chosen to write positively about the festival because “their jobs are on the line”. “So they've got to kneel over and say it’s a success,” he said, without naming any individuals. Despite criticisng this year’s event, Meighan went on to tell Gigwise that he would “love to headline Glastonbury next year”. “We've got a long way yet, got loads more gigs to play and put a record out but it would be lovely if we could,” he said. sometimes you've got to say actually it weren't very good." hmm - only just got round 2 actually reading this post - much as it pains a leicester girl to say this - i reckon that quote could equally apply to the much hyped yet not very good Kasabian.